– Gather valuable materials and craft new items. Expand your Graveyard into a thriving business. Help yourself – gather the valuable resources scattered across the surrounding areas, and explore what this land has to offer. – Explore mysterious dungeons. No medieval game would be complete without those! Take a trip into the unknown, and discover new alchemy ingredients — which may or may not poison a whole bunch of nearby villagers. 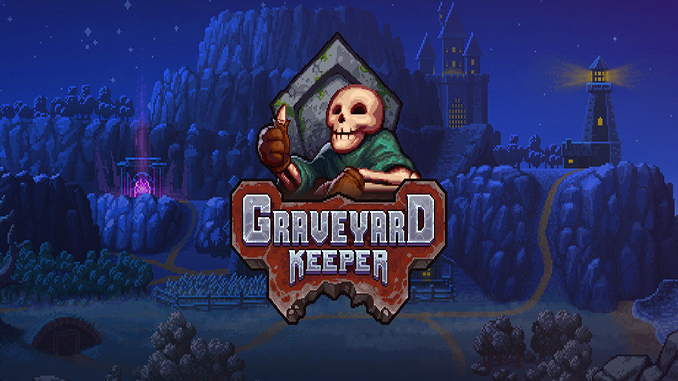 Graveyard Keeper is the most inaccurate medieval cemetery management sim of all time. Build and manage your own graveyard, and expand into other ventures, while finding shortcuts to cut costs. Use all the resources you can find. After all, this is a game about the spirit of capitalism, and doing whatever it takes to build a thriving business. Thanks you!! Would you be able to upload the latest version v1.030 or above? We have updated the download link with the latest version we can find 😀 Have fun! It says there are files missing? We have updated the download like to the latest we can find have you tried it? Thanks for the game! Could you upload the latest version? there seems to be v 1.122 since dec ’18 as per GOG db, can u pls update the download links. Also thanks for all the games and your time. Please update the game there is v1.122 as per GOG Db. the latest ver is 1.122 as of dec 2018. Game closes on me after loading, tried reinstalling it, still having the same issues. Are you sure? this is gog exe and we do not repack any games here. Did you successfully installed the game?